Instead of suffering the post-Olympics blues, I’ve been crazily inundated with global sports. From the second window of FIBA World Cup qualifiers, where France secured their berth in the next round of playoff competition, to the start of the She Believes Cup, it’s been a big week, one that’s not yet over! Sunday Les Bleues play the USWNT here in the New York area, conveniently setting my mood to finish a paper I’m giving next week—more on that soon. But before I dial back into women’s football, I’m eyeing the West Coast Conference in Las Vegas today and its 2018 Hall of Honor inductees, including one French basketteur, Ronny Turiaf (congrats!). Most Americans know Turiaf from his long NBA tenure. But before his storied career and post-“retirement” role as a global citizen, Turiaf tore up the courts with alma mater Gonzaga. As any alumni can tell you, school loyalty runs deep, and Turiaf is no exception, regularly spotted in social media posts at Zags games cheering his team on. And perhaps ties run deeply another way, for Gonzaga has nurtured, more than perhaps any U.S. university, a certain French hoops touch. Gonzaga is having a great season atop the WCC, and counts two basketteurs on its roster. Freshman Joel Ayayi joined sophomore Killian Tillie this year in Spokane, both players, like Turiaf before them, alumni of France’s national sports school, INSEP. And while Turiaf is the best-known French Zag to date, he wasn’t the first. That honor goes to Jean-Claude LeFebvre, the 7’-3” Frenchman who arrived on campus in September 1957. Sports Illustrated profiled the tallest baller in the college game that winter, including the curious story of how LeFebvre was ‘discovered.’ The Eiffel Riffle made his mark for the Zags, and was drafted by the NBA’s Minnesota Lakers in 1960, though he never suited up for the league. LeFebvre’s time in the United States coincided with the first transatlantic overtures of French basketball as it expanded its global horizons. The French were longtime leaders who helped spread hoops in Europe and fixed its rules, but by the postwar period, their game was flat. The arrival of the first U.S. ballers in the 1950s started to change this, especially Cleveland-raised Martin Feinberg. Recruited to play for Paris Université Club, France’s elite basketball club of the era, Feinberg imparted elements of the American game to his friends. 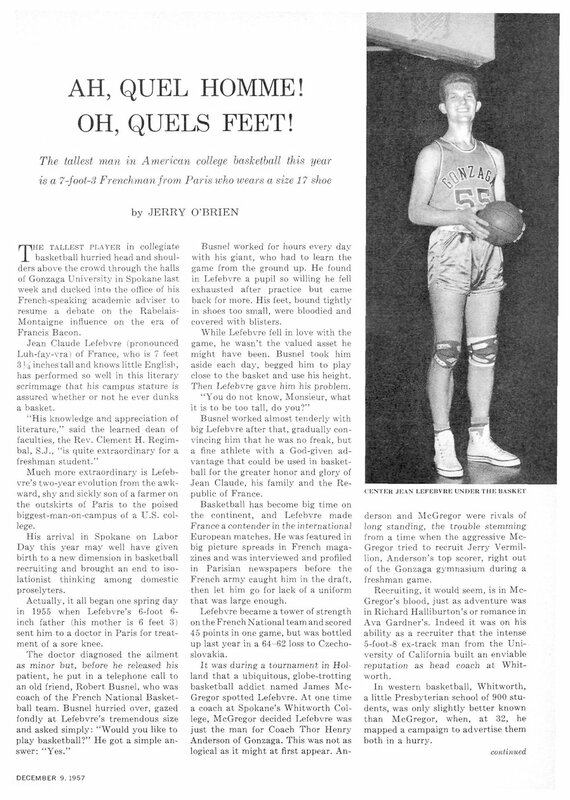 He also organized the first trip by a French hoops team to the United States in 1955, a seminal event in many ways and one that you’ll be hearing more about soon (including in this August’s release of Sport & Diplomacy). Feinberg brought PUC back to the United States in 1962, with player Michel Rat in tow. Rat later made a long career with INSEP’s basketball center and was still there when a young Turiaf arrived from the Antilles in Fall 1998—more on that soon, too. Congratulations to Turiaf on his Hall of Honor induction and for reminding us how the game serves as a cultural bridge in its global role.